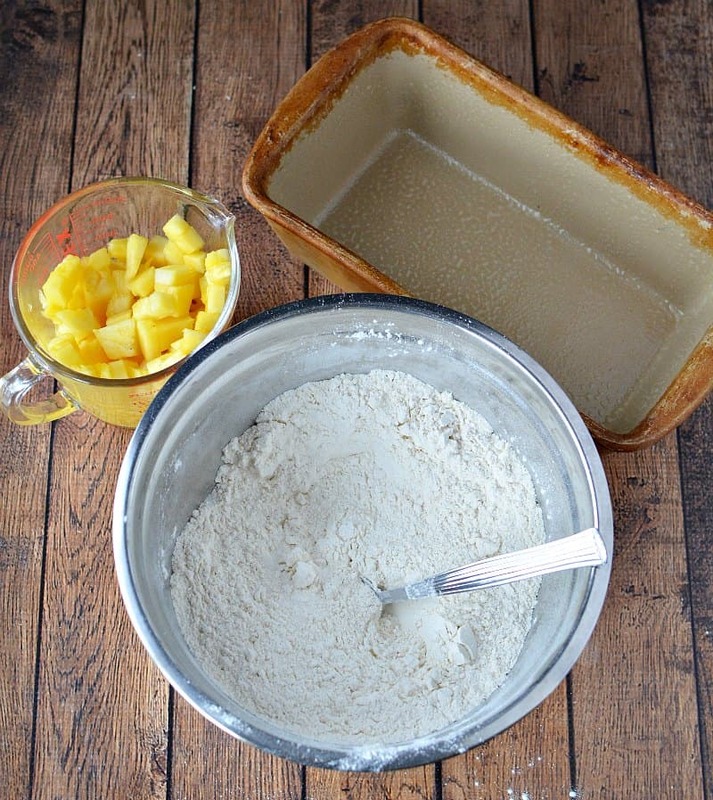 This 3 ingredient pineapple bread recipe uses self-rising flour to help give it a lift! 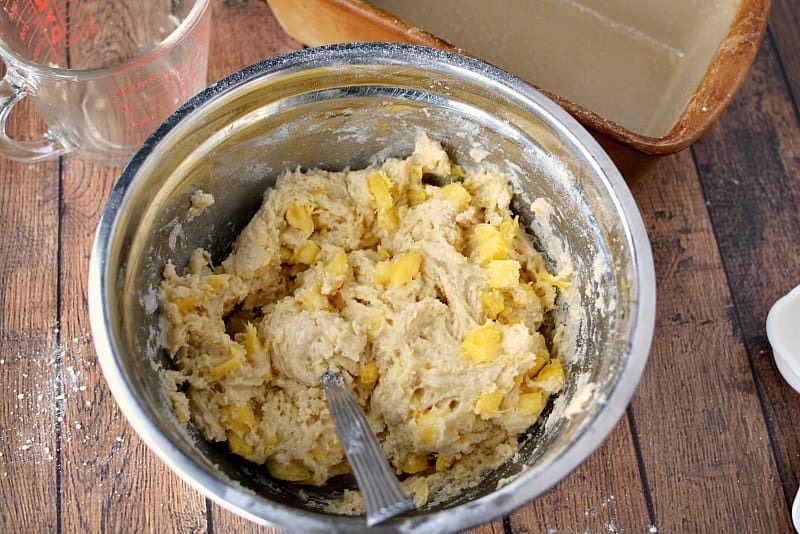 Make with crushed or diced pineapple. I love making bread. I started making bread years ago and found I have a knack for working with yeast bread in particular. I love making anything from monkey bread from scratch to Homemade Focaccia Bread Recipe with Olives and Garlic. I even love to bake bread in a slow cooker to make slow cooker dinner rolls! But homemade bread can require quite a few ingredients and a little time and attention. Until now! 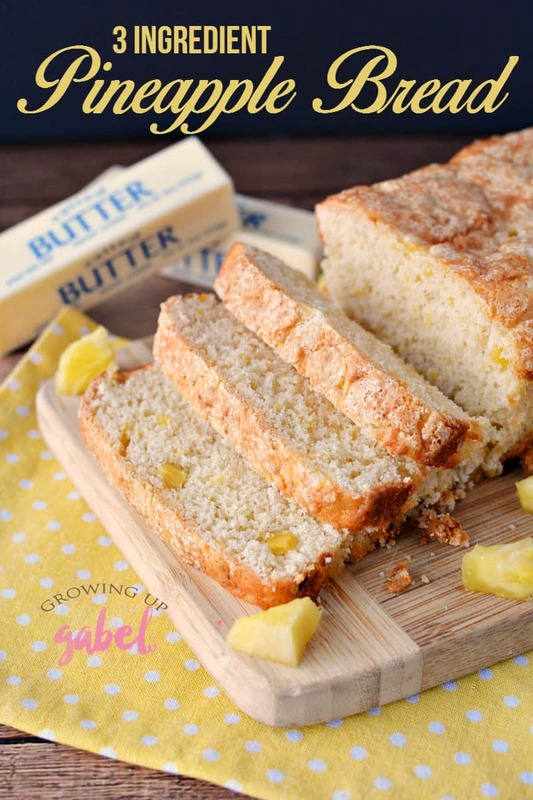 This super simple and easy 3 ingredient pineapple bread reminds me of making beer bread years ago. Dump, stir, bake and done. The trick to this quick bread is self-rising flour. Self-rising flour should be available at any grocery store. If you can't find any, just add 3 teaspoons of baking powder and 1 teaspoon of salt to the recipe. This is basically a dump and stir recipe. 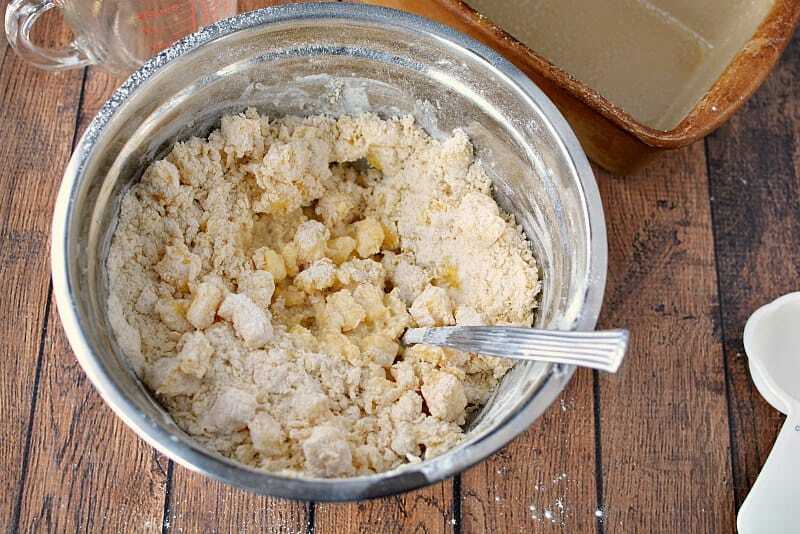 Combine flour and sugar together in a bowl and mix well. Add pineapple and continue to mix. You can use either canned crushed pineapple in this recipe or use fresh pineapple. We diced up a fresh pineapple and added some water to the mix. If you use the canned pineapple, you wont' need the water. Just use the liquid in the can. You also may want to cut back on the sugar if using canned pineapple as that liquid will be sweet already. At first it may seem dry and you'll want to add water — but don't unless using fresh pineapple per the recipe below! Trust the process and the mixture will come together. Plus you can get a little arm workout in while mixing. Mix until the dough forms, but don't over mix of the bread will get tough. 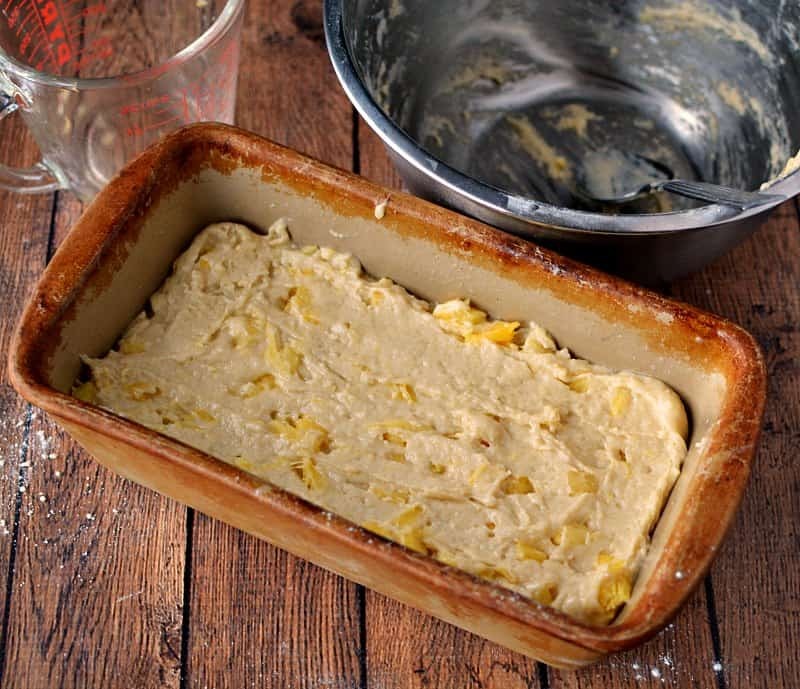 Once the batter has come together, pour batter into a greased bread pan. Bake for 50-60 minutes or until center is set. Start checking around 45 minutes to see if it is done. Allow the bread to cool completely before slicing it. It is of course delicious slathered in butter! Combine flour and sugar together in a bowl and mix well. Add pineapple and continue to mix. At first it may seem dry and you'll want to add water -- but don't (unless using fresh pineapple) and the mixture will come together. Get a little arm workout in while mixing. Pour batter into prepared pan and bake for 50-60 minutes or until center is set. This is the first comment I have ever written. Following your directions and ingredients I made your 3 Ingredient Quick Pineapple Bread using regular flour but added the Baking Powder and Salt. I also used store brand crushed pineapple. it was a disaster and I give it a minus 1 star. After stirring and combining the ingredients per instructions, it never looked like the pictures you showed nor did I struggle stirring it. Testing it for doneness I left it in the oven for 60 minutes. I used a non-stick pan but it adhered to the pan and I needed to lift the bread out with a metal turnover. The top was only lightly browned and smooth but the sides and bottom looked nice. Using a serrated knife I attempted to slice the bread but the sides and bottom were like slicing leather. It never tasted of pineapple either. As I said it was terrible and I tossed it out the next day. Hey, Camille! 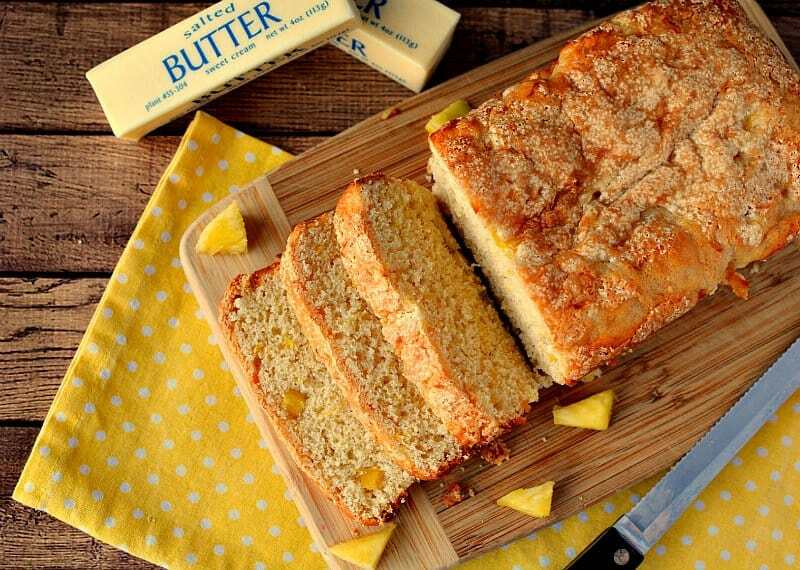 Just wanted to let you know that we loved your Pineapple Bread Recipe so much when you shared it at the #HomeMattersParty last week, we’ve HIGHLIGHTED it THIS WEEK! Hope you can check it out when you get a sec. Happy Friday!!! Oh, I have pineapple. I just might have to make this! Thanks for sharing at the Inspiration Spotlight party. Pinned & shared. Oh yum! I love quick breads but never thought there was such a thing as a pineapple one! Pinning!! 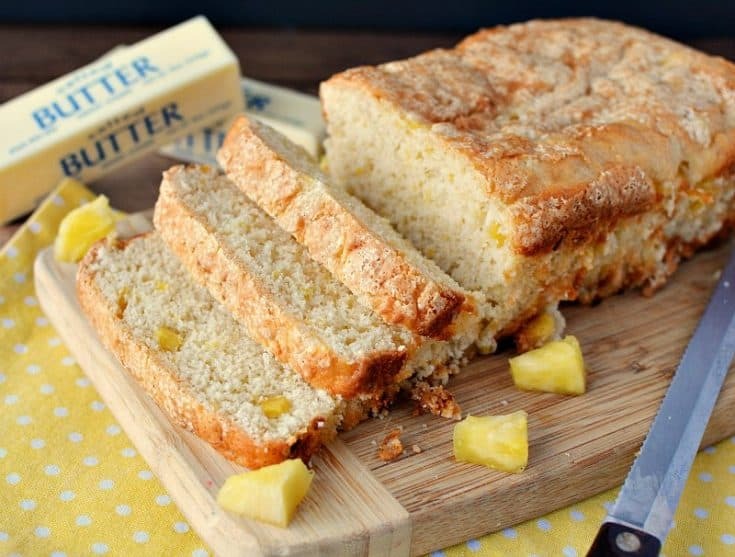 We love pineapple and this bread will be awesome! Hope you are having a great week and thanks so much for sharing with us at Full Plate Thursday! I just found some frozen crushed pineapple in the freezer left over from some other recipe. It isn’t enough for anything big, but might just be perfect for this recipe. Thanks so much for sharing it at the Snickerdoodle linkup (which is where I saw it). I’ve never had pineapple bread, but now I want to try some. Your recipe sounds delicious.Thanks for sharing at Snickerdoodle. We’ll be featuring this at tomorrow’s party. Hope to see you there. This sounds so easy and looks delicious! Can’t wait to try. Thank you for sharing at Merry Monday! This bread looks SO delectable! Thanks so much for sharing your yummy recipe on the Monday Funday Party! I can’t remember having ever heard of pineapple bread, so I asked my husband who looked at me like I was crazy and said that of course he’d heard of it. (But he grew up in Hawaii, and ate pineapple everything so I’m not sure he’s the best person to ask.) 🙂 So when I saw this I HAD to come check it out. It sounds amazing and I can’t wait to try it! Pinning! Looks simple and sounds great! Thanks for sharing on the What’s for Dinner link up!